Hello! It's week 3 for the current CR84FN Challenge! If you haven't played along yet, you have just under a week to play in CR84FN50. 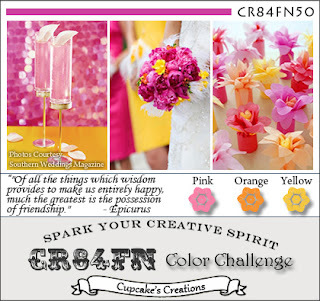 Our color palette is Pink, Orange and Yellow. Photos courtesy of Southern Weddings Magazine. As a reminder, due to Spring Break, this challenge will last for 3 weeks, so you still have another week to play along! 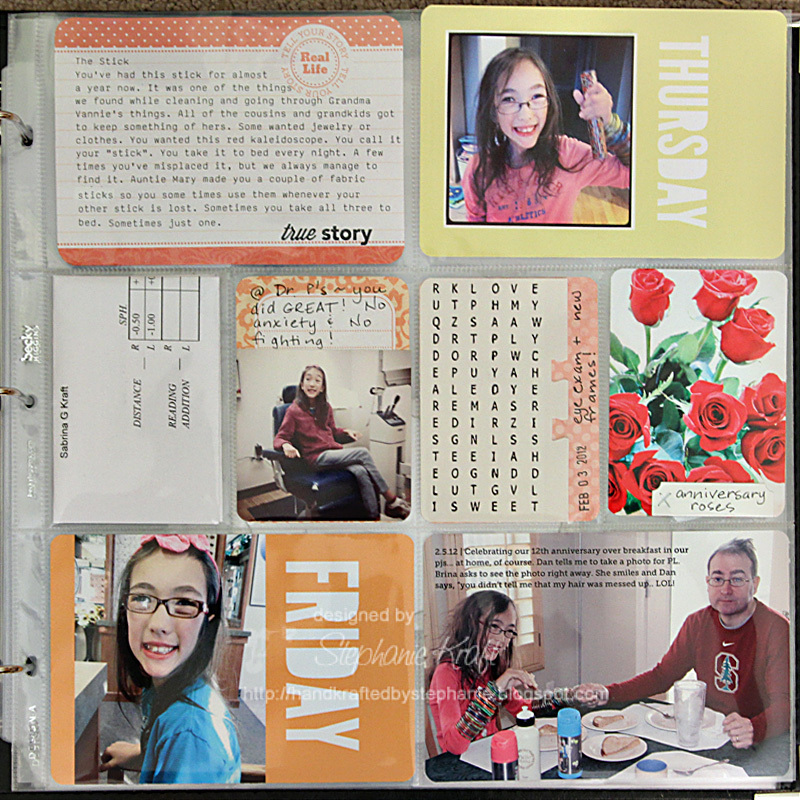 I'm back with another Project Life spread. This is week 5 of my 2012 album, and it spans 1/31 - 2/5. After using these colors with week 4, I realized that they would work for week 5 as well. I'm excited to have another week in 2012 documented! My spread starts on Tuesday, 1/31, which is the day that I flew home after being away for 4 days at CHA. I came home early enough to be able to pick Sabrina up from school, and Wednesday for a staff development day, so it was a bonus day for us since I had missed the weekend with her. The rest of week consisted of back to school, eye doctor appt / picking out new glasses and finally, Dan and I celebrating our 12th anniversary on Sunday. 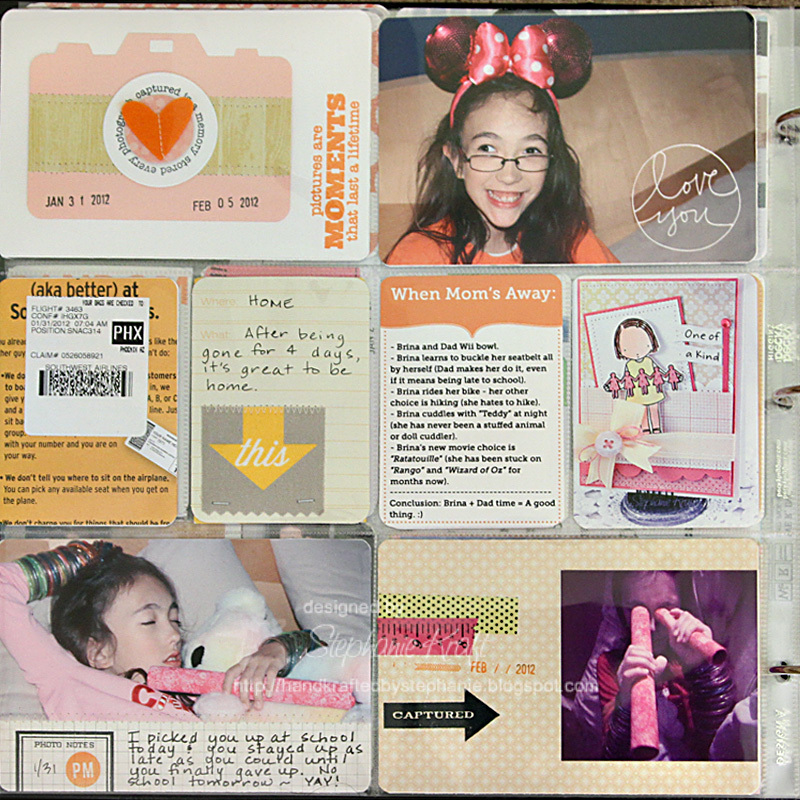 I addition to photos and journaling, I included a few pieces of ephemera from the week - a copy of my baggage claim tag on the left side and a copy of Sabrina's new prescription on the right. Another great project, and a wonderful way to preserve these moments in time. I'm sure these pages will bring back so many memories in the future. Stephanie - I've so much enjoyed sharing your Project Life layouts - this is such a super way to keep the memories (and a bit quicker than a "normal" scrapbook). Sabrina looks lovely - both awake and asleep. Stephanie this is so wonderful! 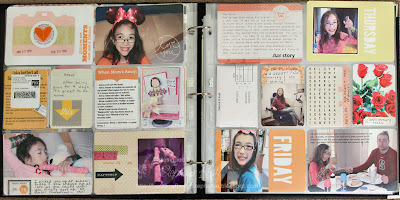 love the details, photos and ephemera! Beautiful! You will be missed on the DT! I know where to find you and look forward to still seeing your wonderful art on your blog! I am just LOVING your Project Life. What a SUPER way to document your year! So many CUTE photos and so many FAB memories in just one week! Thanks so much for sharing all of your wonderful creations with us, Stephanie! I am going to MISS you being on our Design Team!